The unusually restless sun spew vast amounts of particles at us almost throughout September, which wreaked havoc on the AM band. However, there was still a daily opening towards Argentina before sunrise. From the eastern front, we logged a handful of rare stations from the Philippines, but only few from Australia, which was our most coveted target this time of the year. It had been a long wait. 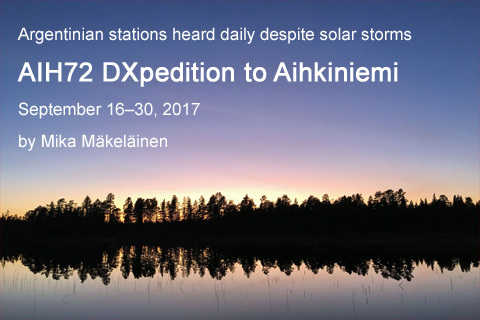 After working in China for two years and not having an opportunity to visit Aihkiniemi since the AIH39 DXpedition in 2014, I was anxiously looking forward to this season's first Lapland DXpedition. 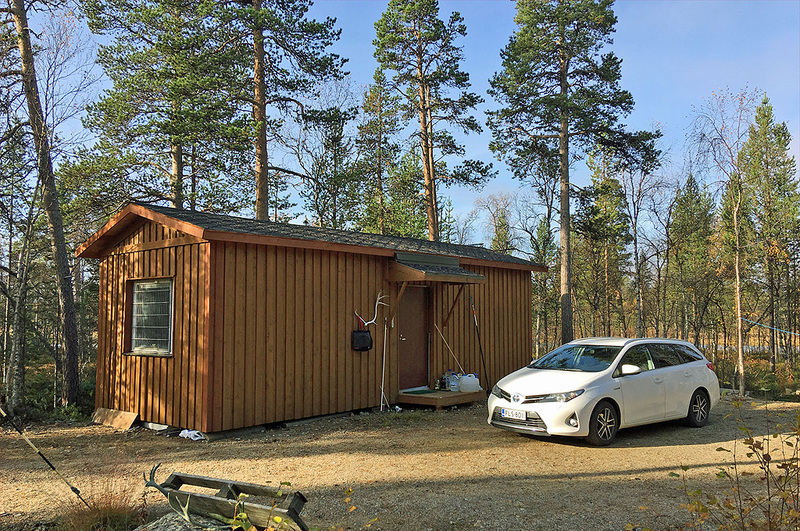 My schedule was flexible, so I opted for a leisurely drive and divided the 1260-kilometer (780-mile) journey through Finland into two days, meeting many fellow DXers along the way. 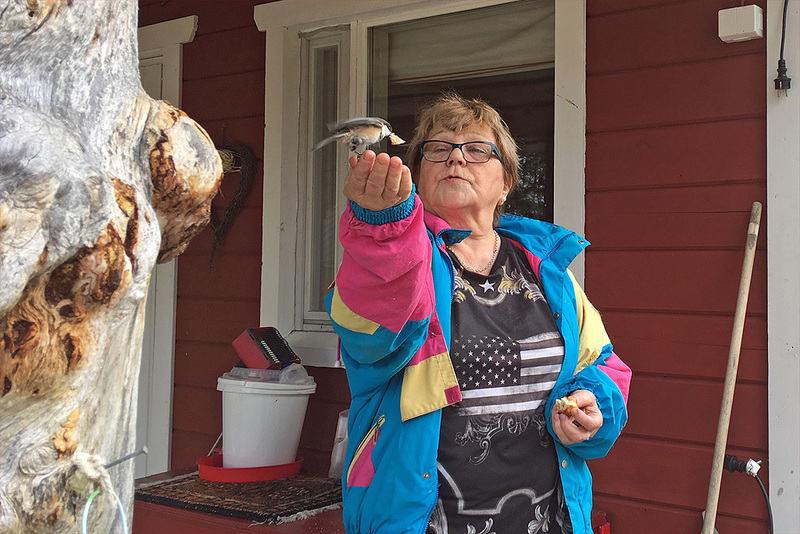 I set off from Vantaa on Friday after 11 a.m., and two hours later I arrived at DXer Jorma Mäntyläs home in Kangasala. Jorma would join me in Aihkiniemi a week later, but he was going to travel by train and bus, so I took most of his luggage up north by car. Driving further north near Jämsä, oncoming traffic hurled a stone into my windshield. By a stroke of luck, I was approaching Jyväskylä, and I made it to a windshield repair shop just minutes before closing time, got the small hole fixed, and was able to continue my journey north. Vaskikello sells decent burgers, but the distance pole outside has seen better days. 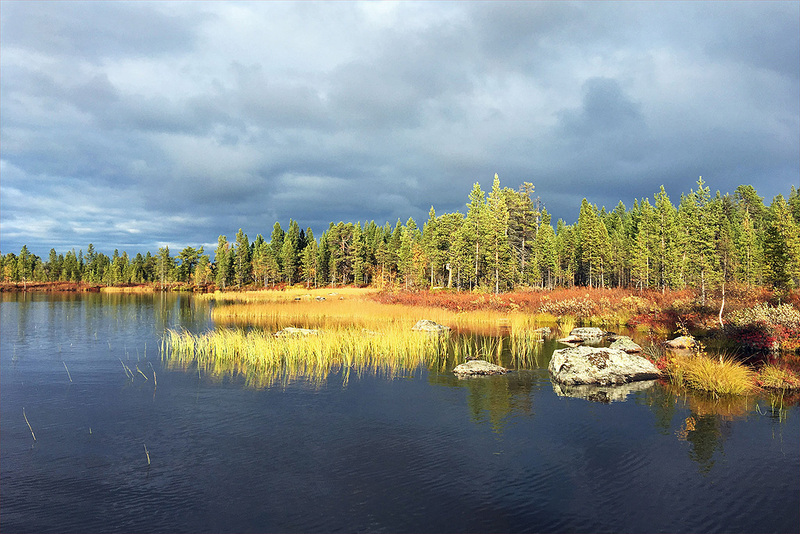 As anyone driving from south to north can attest, roadside sceneries in Finland consist of forests, more forests, and the occasional lake. 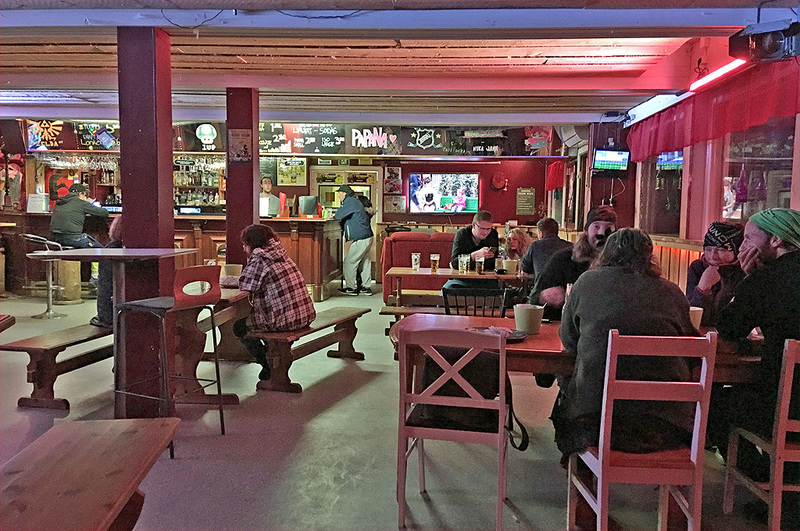 Driving from Jyväskylä to Oulu is a boring stretch without any major towns, made easier by the Vaskikello pit stop in Pyhäsalmi. This highway diner has stubbornly remained independent while most eateries belong to nationwide chains. Vaskikellos lure is a collection of 1600 bells of all sizes from all around the world  and they do make decent burgers. After sunset and 635 kilometers I arrived at the brand new home of Jari Ruohomäki near Oulu, where we had a wonderful DXers' reunion, as also Pertti Äyräs from Turku was present. Jari and Pertti set out to Lemmenjoki on Saturday morning while I left already a bit earlier to continue to Aihkiniemi. 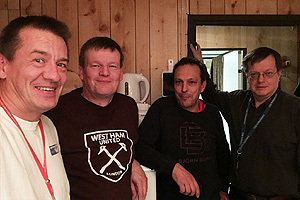 I have been on DXpeditions with both Pertti back in 2009 on LEM278 and with Jari on several midwinter DXpeditions, the most recent one being LEM287. On the way north on Saturday, September 16th, I met Martti Karimies, who had just been DXing in Aihkiniemi for a week. Martti left early as conditions were really poor and there was nothing to listen to after daybreak. Our paths crossed at Café Harianne in Yläpostojoki, where we exchanged the latest DX news and whined about the crappy propagation conditions over a cloudberry pancake. A couple of hours later I arrived in Ivalo, the last full-service shopping town before the wilderness. There I met Lauri Niemi, who had already been in Aihkiniemi for a week and a half, and was taking a break from DXing and getting exposed to civilization. We had lunch, a king crab sandwich at a café, went shopping for groceries, and then drove to Aihkiniemi. I could never have imagined getting king crab at an ordinary café next to a supermarket. Ivalo's culinary offerings have certainly improved over the years. 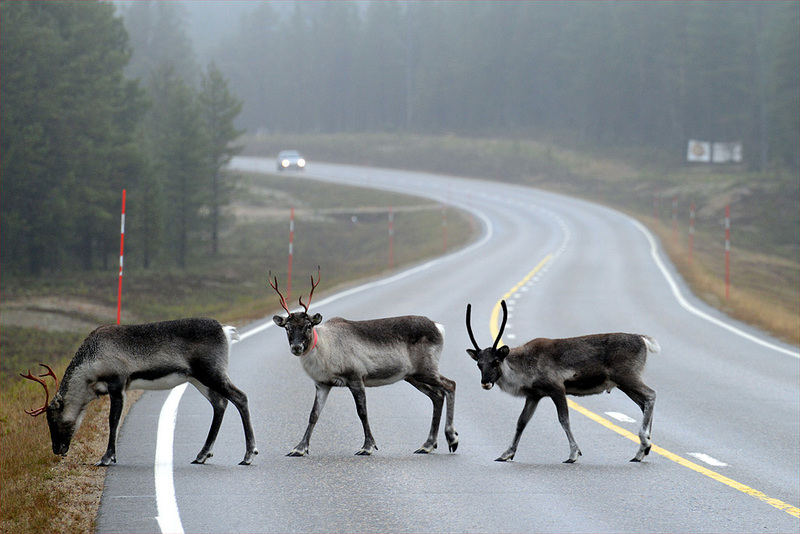 Driving was a delight as roads in Lapland are still free of ice and snow in September, and also because there were only few reindeer creating hazardous situations. Fall colors ranging from yellow to red decorate the roadside. 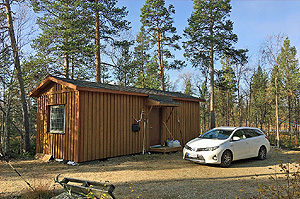 And what a feeling it was to see the Aihkiniemi cabin for the first time in three years! 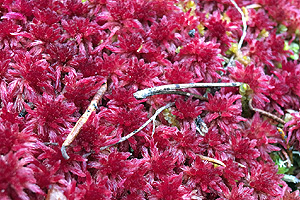 Fen peatmoss (heterahkasammal) grows bright red in the area. Getting all the gear working in Aihkiniemi was more cumbersome than normally since I hadnt compiled my setup for three years. I had a new antenna switchbox, but otherwise I relied on equipment that I had used for years. Eventually I got two Perseus receivers running, operated with Jaguar software, and by early Sunday, I was ready to welcome the onslaught of distant signals. Too bad that there weren't any, as solar activity remained intense. Since the sun had released the most powerful solar flare in more than a decade on September 6, space weather, and consequently long-distance AM propagation, had been in constant turmoil. Recovery had only just begun when I arrived. 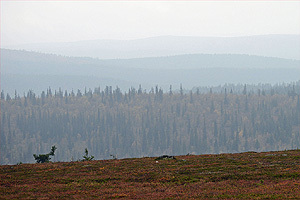 There was no radio blackout, but neither was it possible to hear anything from northern latitudes either eastwards or westwards from Lapland. 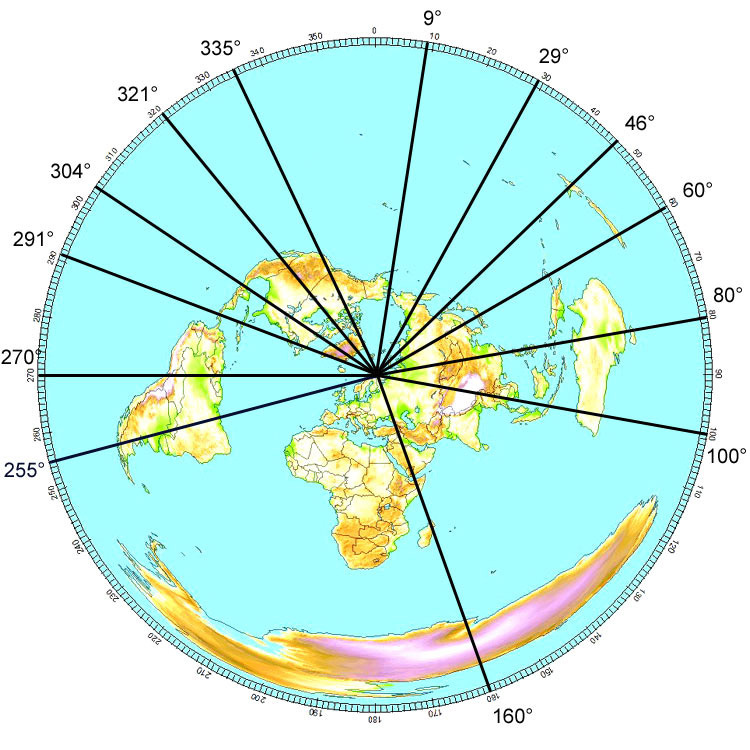 The best propagation to the Eastern Hemisphere occurred on September 2526, and the best opening to Argentina and neighboring countries was a bit earlier, on September 24. As the chart below (info compiled by Jan Alvestad) shows, this was when the planetary A index reached its lowest point hovering around 35. On September 27th the A index jumped to 32 and on the following day to 44, hitting temporarily even close to 100. 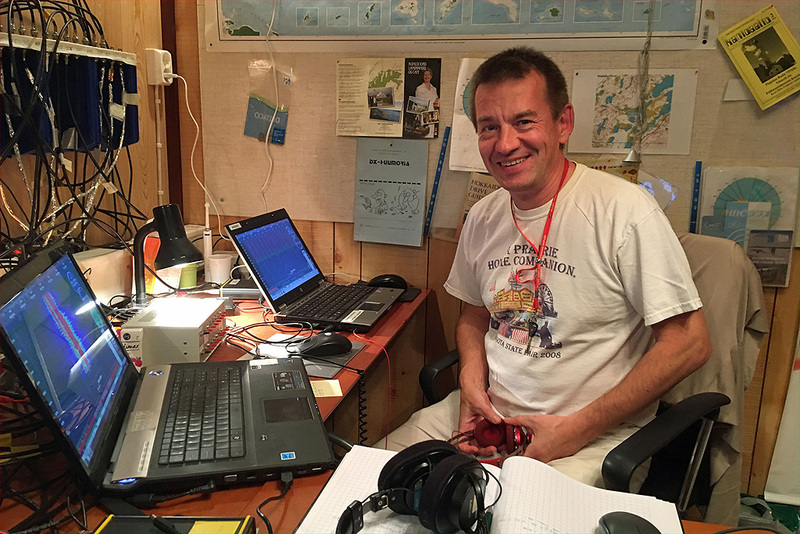 During this DXpedition there were some parallel AM DXing efforts in the Arctic. 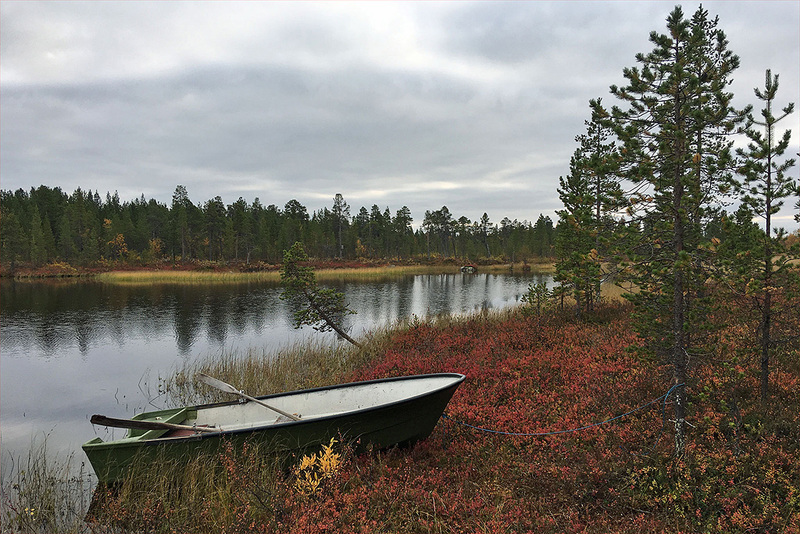 In Lemmenjoki, LEM386 took place from September 1624, and in Sweden, PAX120 DXpedition (link opens an RTF file) began on September 27. With all the hassle of getting settled, I didnt really miss anything on the dial. Just some Indian and Middle East stations were audible in the evening. Overnight the first weak Brazilian stations emerged after 2100 UTC. I also hunted for African stations with a wire pointed at 160 degrees, but have so far found nothing new. The overnight recording was also of poor technical quality, so I decided to ditch Perseus software in favor of Jaguar. There is some unresolved issue with the Aihkiniemi laptops and Perseus recordings, causing disturbance in the sound, so if you're planning to come over this fall, bring your own laptop(s) with Perseus software pre-installed and tested, if you're planning to use Perseus software. However, I would recommend Jaguar instead. The morning was a pleasant surprise, although I didn't immediately log any stations that would have been personally new catches. In any case, stations from Brazil, Argentina and Uruguay peaked at 02000300 UTC, and signals were nice and clean especially in the lower end of the AM dial. 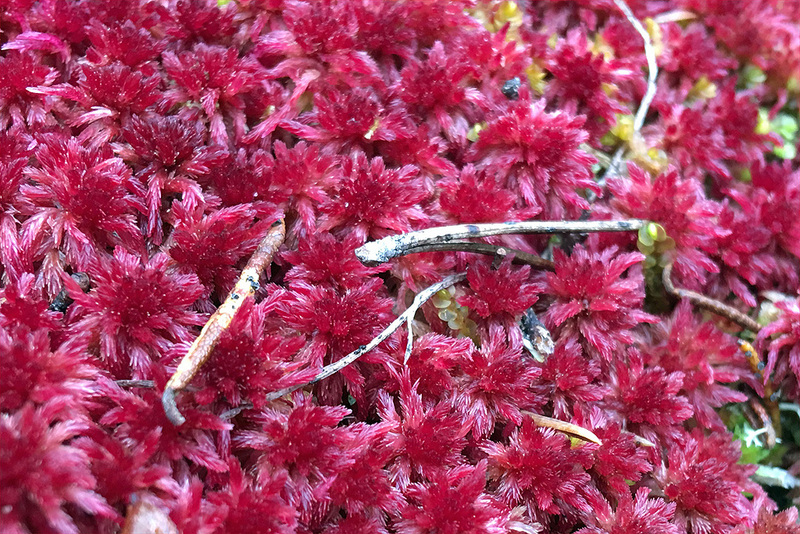 I spent daytime catching up on sleep and checking antennas in the forest. In the evening, the first Asian signals appeared before 1600 UTC, especially from around Bangladesh, but selection was very limited and signal strength remained poor. There was a brief opening as far north as Tianjin around 1800 UTC, but the few stations from the Far East soon gave way to Iranians, which dominated half of the AM frequencies. 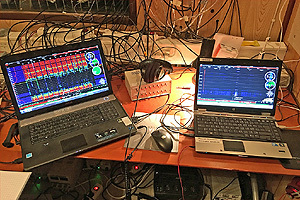 Brazilian stations began to emerge for real by 2200 UTC on Sunday evening. Mediocre conditions prevailed until about 0130 UTC, when signal levels dropped sharply  just when I expected them to improve further. Signals resurfaced at 0300 UTC, dipping soon and making a modest comeback around 0415 UTC. Some Argentine stations lingered on until around 0530 UTC, especially in the lower end of the dial, but signal levels were poor. So far the only new catch for me was Radio Nacional, Comodoro Rivadavia/Chos Malal, Argentina, on 670 kHz. As a curiosity, Norwegian low-power (0.25 kW) station Radio Northern Star from Bergen (1611 kHz) was audible through the night, best at 0100 UTC. Just like on Sunday, mostly we have used just two of the 13 antennas: 255 and 160 degrees. 255 brings stations from Brazil and Argentina before daybreak, and the 160-degree wire is good for stations from Eastern and Southern Africa, which also tend to peak before daybreak, around 0230-0300 UTC. Stations from Southern Africa were heard exceptionally well on Monday before daybreak. Botswana was heard on 648, 693 and 972 kHz, as well as South African stations on 657 kHz (Radio Pulpit), 702 kHz (LM Radio) and on 828 kHz (Magic 828). After 0600 UTC the dial was empty until almost 1700 UTC. Cambodia (918 kHz) was strong at closedown after 1700 UTC. Australia's westernmost ABC powerhouse (6PB in Busselton WA on 1152 kHz) made a brief appearance, but otherwise signals didn't extend much beyond India. In the evening Middle East stations filled the dial. I was most happy about hearing Sawt al-Amal (Voice of Hope) from Israel on 1287 kHz with a booming signal. Again there was wild variation in the levels of transatlantic signals. Some Brazilians were heard around 2330 UTC, diving soon after, and reappearing just before 0200 UTC. Propagation peaked at 0330 UTC, and stations vanished sharply just after 0400 UTC. Latin American catches included LRA54 Radio Nacional from Ingeniero Jacobacci on 1370 kHz (first spotted by Lauri) and Radio Nacional de Brasília from an unknown location on 1310 kHz. Radio Portales from Chile was remarkably strong on 1180.07 kHz. For a short while propagation reached even higher latitudes as Harbour Light of the Windwards was heard on 1400 kHz. Daytime was naturally empty on the AM dial. In the evening recordings were initiated just before 1600 UTC for the Indian subcontinent. A bit later also the path straight south was open. Some semi-common AIR stations were reported, but nothing worth mentioning. Overall, signal levels however were higher than on the preceding days, which could be interpreted as a sign and result of modestly improving solar weather. 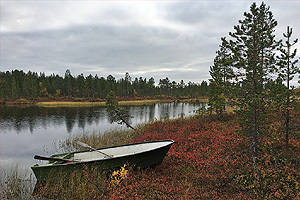 We have a rowing boat to get across a small pond to an area where most of the antennas are located. Overnight was generally very poor to all directions, but once again stations from Brazil, Argentina, Uruguay and  today more than before  also from Paraguay were heard with sufficient signal levels around 03000500 UTC. My best catches that I have so far identified include Radio Belgrano from Buenos Aires and Radio Uno from Asunción, both on 650 kHz. 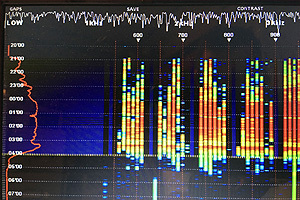 Also stations from southern parts of Africa were audible, best around 02000300 UTC, but their overnight programs tend to be mostly non-stop music, which makes identifying difficult. In late afternoon, stations from the Eastern Hemisphere became audible earlier than on any other previous day. Already at 1458 UTC I started recording with an antenna pointing at 100 degrees, good for South Asia. Around 1700 UTC the first Aussies were on the dial, but initial listening didn't reveal anything besides some of the usual suspects from South Australia (729, 891 and 1539 kHz), heard best with the 80-degree antenna. This is how Jaguar can visualize propagation conditions: the red line on the left indicates overall signal strength on transatlantic frequencies in the morning hours of Sept 21, and on the right, signal strength is shown separately on each frequency over time. The first Brazilian stations became audible around 2100 UTC on Wednesday, and improved gradually after midnight. Signals peaked briefly at 0320 UTC, but dipped soon and vanished by 0400 UTC, so this bout of long-distance reception turned out to be quite short. My identified stations included Radio Argentina (570.013 kHz) and AM 750, both from Buenos Aires, as well as Radio La Unión (800 kHz) and Radio Monumental (1080 kHz) from Paraguay, but only Radio La Unión was a new catch for me. Some sub-Saharan African stations were also heard in the wee hours on the 160-degree wire, such as Malawi on 756 kHz and Lesotho on 891 kHz, but once again Lesotho played only non-stop music before getting pounded by Turkey which began its broadcast day just before 0300 UTC. The evening was less exciting than on the previous day. I began recording at 1555 UTC with a wire at 100 degrees towards South Asia. I had an interesting unidentified Chinese station on 1053 kHz, which I suspected to be Jiangsu Wenyi Guangbo, and this was confirmed later by Chinese DX friends, but otherwise there wasn't much of interest. Thankfully, a couple of Western Australian stations showed up later in the evening, but we found nothing new. Although solar indices have approached normal levels, propagation conditions repeated the cycle of the previous days. Nighttime was poor to all directions and in the morning stations from Argentina and neighboring countries appeared for a couple of hours, today starting around 0230 UTC and peaking around 0400 UTC. My best catches were Radio Nacional from Formosa (820 kHz), Radio Impacto from Ciudad Madero (1440 kHz) and Radio Selva from Partido de la Matanza (1709.856 kHz). Sunset offered the usual selection of stations mostly from the Indian subcontinent, with the Middle East soon taking over. Just by accident I noticed that the IRIB Hamadan transmitter on 981 kHz has also local programming (identified at 1800 UTC), and not just national as listed in the WRTH. 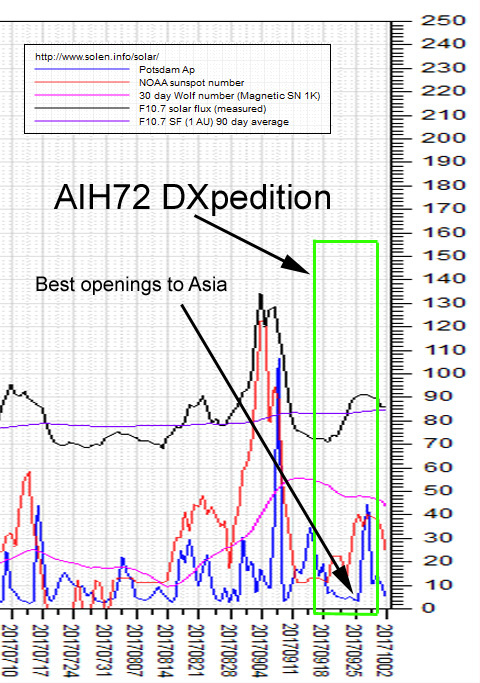 Considering that solar indices are quite decent, I thought that DXing couldnt get any worse, but prospects for new catches on Saturday were even bleaker than on Friday. A few Indians were identified around their sign-on time, the best catch being AIR Gulbarga on 1107 kHz. 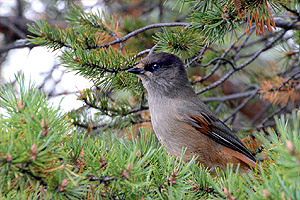 Daybreak coincided with the usual opening to Argentina, but at least initially nothing new was discovered. There was actually an even earlier  but weak  opening around midnight UTC, after which transatlantic signals retreated and made a modest comeback peaking around 0400 UTC and vanishing soon thereafter. 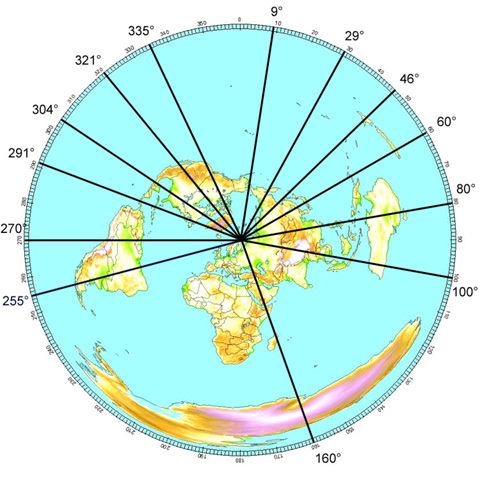 The evening window to the Eastern Hemisphere opened around 1500 UTC, but hardly anything was heard east of India. And of course, this being a Saturday, virtually void of local breaks, in the evening Spanish stations were stronger than on any previous day. Frustration is setting in. If it sounds like Im repeating myself, thats because propagation seems to be repeating itself. A few sub-Saharan African stations where noticed before daybreak, as well as a bunch of Latin American stations rising from the background hiss slightly later. Daybreak itself however turned out to be better than before. Reception from Argentina peaked luckily at 0400 UTC, and especially the lower end of the AM dial was in full swing, which resulted in at least eight new catches for me. Many of them were affiliates of Radio Nacional, relaying the main station on 870 kHz. There are bound to be many goodies waiting in the wide band Perseus recordings. One of my catches was Radio San Rafael on 620 kHz. The station made a live phone interview for the radio and an article on their website (where you can also listen to the interview) about me picking up their station. Western Europe was also very strong, so at the same time I nailed some of the few remaining Portuguese stations. In the evening, a bit of Western Australia was heard, but nothing new. Otherwise the band was dominated by Middle Eastern stations. Evening recordings were mostly unattended, because it was a time for a change of the guard: I drove Lauri Niemi to Inari, from where he would continue home south by bus. 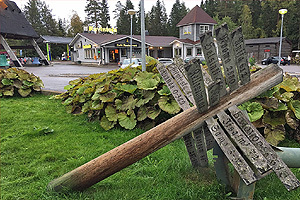 Lauri had spent 19 days in Aihkiniemi, perhaps a longer stretch of DXing than anyone else. Once Lauri goes through his recordings, there is bound to be a monster log, even though propagation conditions were quite unstable. Jorma Mäntylä arrived in Aihkiniemi for my second week there. On the same trip to civilization, I had a pizza at Papana restaurant, the local watering hole in Inari, shopped for some more groceries, and then I picked up Jorma Mäntylä, who arrived to Inari by bus. He is due to DX in Aihkiniemi for the upcoming two weeks. 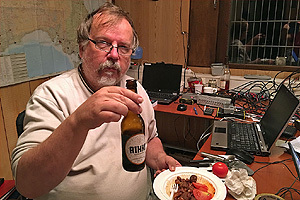 I had last been on a DXpedition with Jorma 20 years ago, so I knew we would have a fabulous week of professional DXing ahead of us. Monday offered more of the same. The morning peak around 0400 UTC favored Argentina, but was not as strong as on Sunday. Nevertheless, I was able to identify a couple of personal new ones, La Voz del Chaco Paraguayo, from Filadelfia, on 610 kHz, as well as Estación 1550 from Buenos Aires on 1550 kHz. The 650-gram perch was probably the biggest perch that I've caught with a fishing rod. During the day, in addition to catching up on sleep, we enjoyed the outdoors. 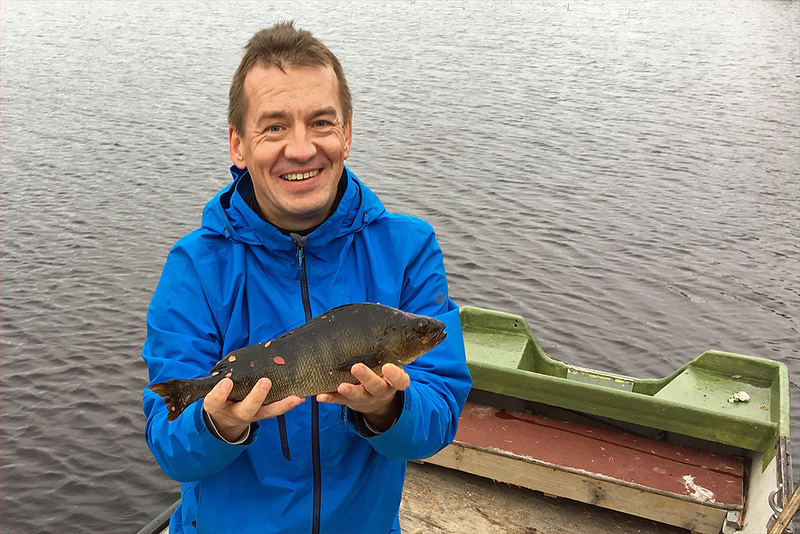 I went fishing and caught a 650-gram perch from one of the small ponds near our antennas. The perch became our dinner, while I released a larger pike, caught from Turvelompolat outside the cabin, back in. 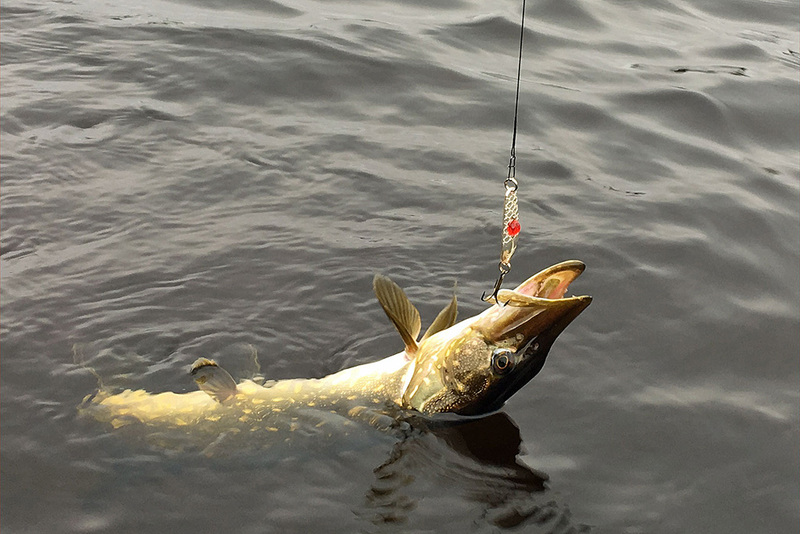 Along with the cabin we own fishing rights to many nearby areas, so fishing offers also some untested opportunities. 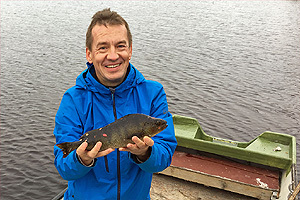 Jorma went picking lingonberries and was equally happy about his catch. In the evening, the first Far Eastern stations appeared after 1300 UTC, which was much earlier than on any day before, but as reception improved around 1500 UTC, the selection covered all of Asia, making any new catches very unlikely. 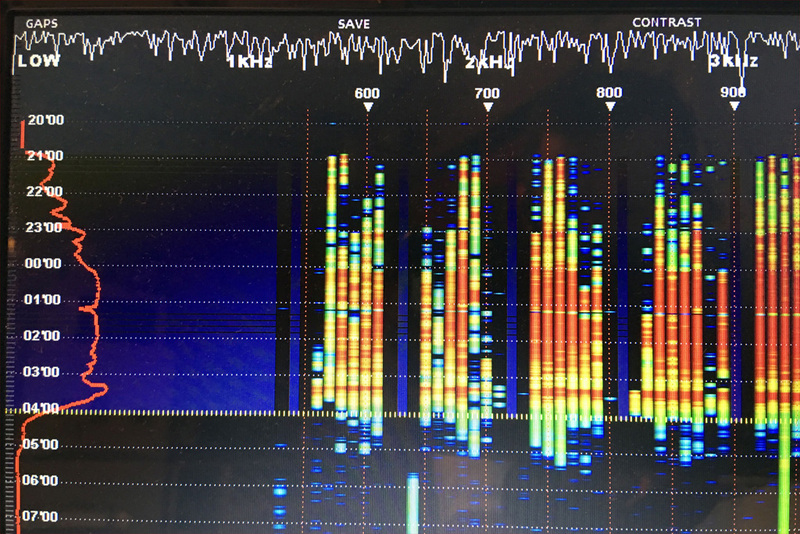 After 1800 UTC we witnessed improved reception of the couple of ABC powerhouses in South Australia, which prompted a frantic search for smaller stations from the state. 5DN Adelaide on 1323 kHz was the only new station that I caught live, but that was enough to make my day. Weak stations from Latin America were heard through the night, but signal strength didn't quite reach the level of the previous days. Soon after 0400 UTC stations from Argentina, Brazil and Chile (such as Radio María from Santiago on 1060 kHz) vanished, but for the first time, some common North American stations (including 1390 WEGP and 1520 WWKB) came forth around 0500 UTC and again briefly at 0620 UTC. After about 0635 UTC there was just static. During the day I checked a couple of antennas while Jorma was picking berries. Neither of us ran into bears. 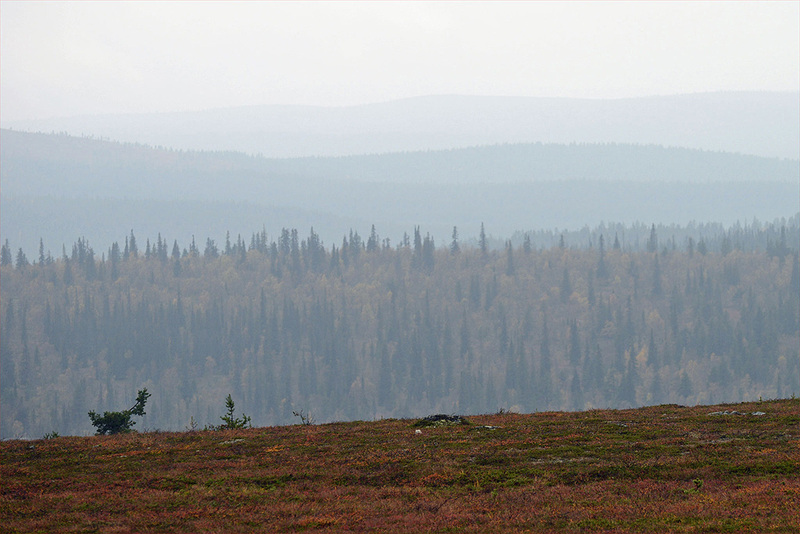 We were careful not to get eaten, or shot, since we knew that there are two bears regularly in the vicinity and that a bear hunt was ongoing in the area. 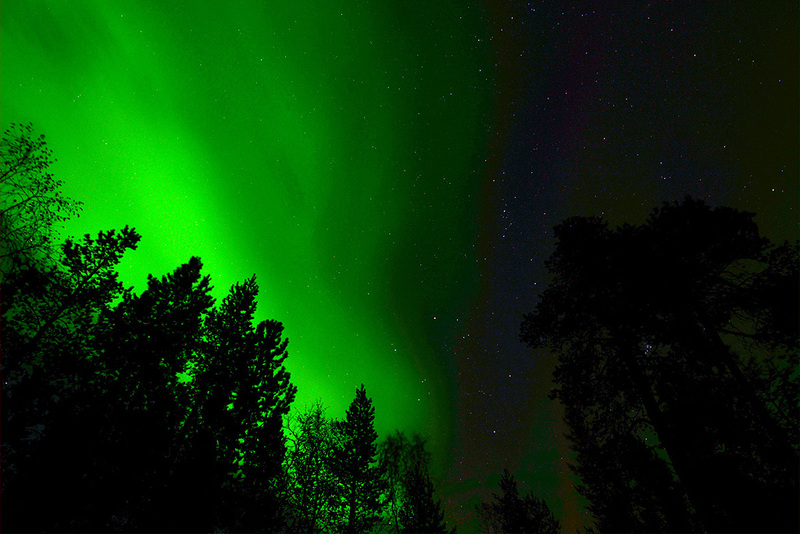 Northern lights would have been visible almost every night, but most of the time it was cloudy. In late afternoon, the first Asian signals began to appear already around 1300 UTC, but signals reached usable levels only around 1400 UTC. What ensued was the best propagation to Asia so far on this DXpedition. Finding new ones was tough, but fortunately good propagation persisted, and eventually just before sunrise in East Asia, after 2100 UTC, we nailed DYKR (1161 kHz) and DXRU (1188 kHz), a true DX station! On the Aussie front 3RN ABC Radio National from Melbourne made it through on 621 kHz. This is one of the many frequencies which have become new treasure troves after being vacated by semi-local Russian AM stations. Also Qinghai PBS was heard on 621 kHz making its first appearance in Europe. On Tuesday evening transatlantic signals became audible quite early, while we were still focused on the Philippines. By 2200 UTC many Argentinian and Brazilian stations were already relatively strong. 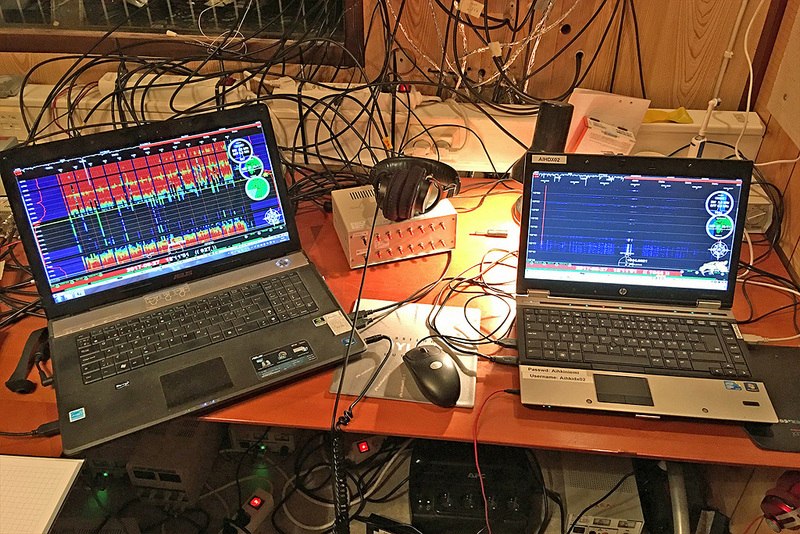 Signals were best around 02000400 UTC, but unfortunately nosedived well before 0500 UTC. A smattering of North American stations, mostly from the Midwest, was heard before midnight UTC and again around daybreak, but the signals were so weak that we didnt even bother to try to find anything new. Radio 2000 from Venezuela on 1500 kHz was perhaps the last station to remain strong on the dial well after 0500 UTC. Siberian jay is a curious bird that often comes really close to observe people. 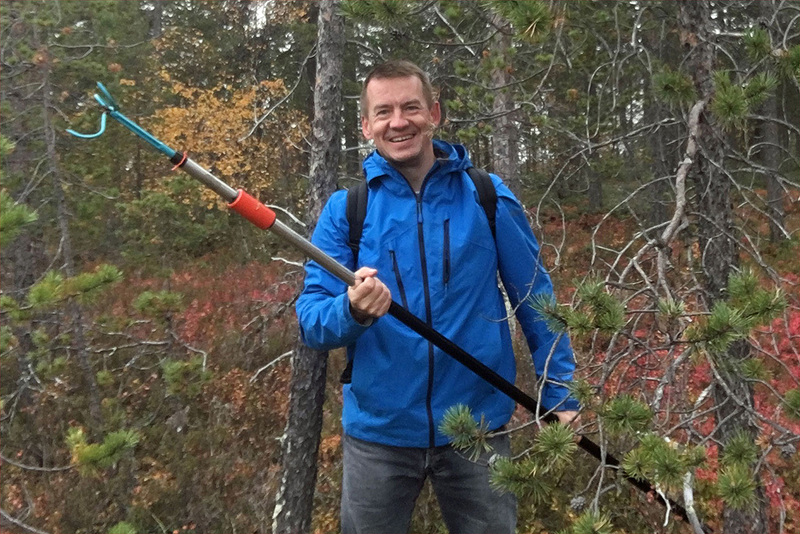 During the day, I checked and mapped the remaining antennas and Jorma found more lingonberries. Now I have all the necessary coordinates to draw e-maps of the current antenna arsenal. 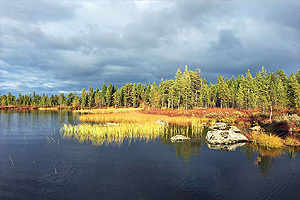 This info will be available to Aihkiniemi visitors later in the season. Despite the fierce solar weather, surprisingly, some North American stations were heard overnight on two brief occasions, peaking around 0100 and 0300 UTC. I identified a few East Coast stations like WXKS on 1200 kHz, but didnt find anything of interest. Before daybreak, sub-Saharan Africa was weak. Our Africa wire yielded a Greek pirate on 783 kHz. In the evening, just some Indian, Iranian and Arabic stations made it through. The entire day was quite disappointing, and at least in real time I didnt log any new stations. Overnight, stations from Argentina and surrounding countries appeared on the dial after 0040 UTC, and signals remained decent until after 0200 UTC, when propagation from this direction folded. So far I have only logged some usual suspects. After 0300 UTC signals from the East Coast of North America were heard, but signals remained weak, and the stations vanished by 0400 UTC. Also around 0300 UTC, on the African front Botswana was strongest on 693 kHz and heard on a couple of other frequencies as well. Another Greek pirate seemed to be operating on 1107 kHz. 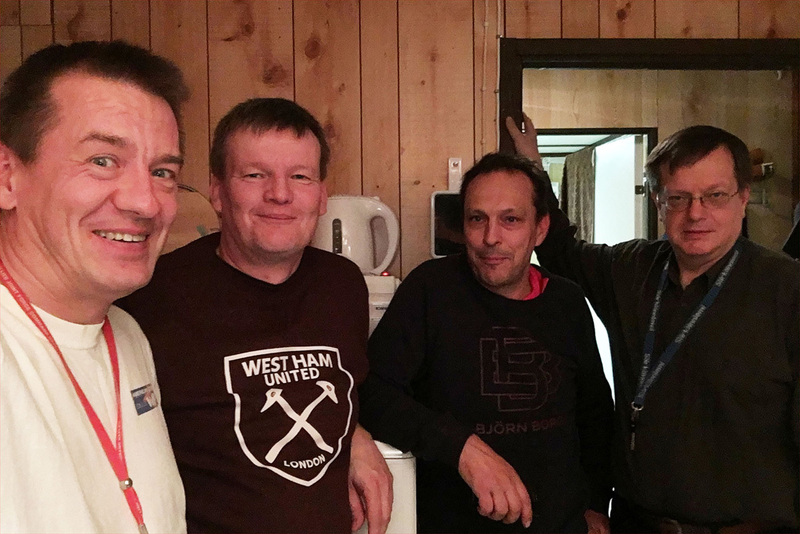 Here we can see a total of about 150 years of DXperience: Mika Mäkeläinen (left), Tuomo Vesala, Kimmo Vuorela and Jorma Mäntylä. I didnt have high expectations for the evening, but surprisingly, stations from the Far East, all the way up to Central Japan emerged from the static around 1410 UTC. Gradually, stations from China and India joined in the mix, but while some signals were quite strong, there was barely anything audible on many other frequencies. 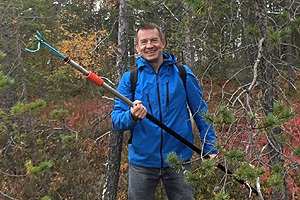 In early evening, I left my two Perseus receivers to take care of recording the AM band as we had rare visitors: fellow DXers Kimmo Vuorela and Tuomo Vesala came from Ivalo (over 100 km away) to say hello. 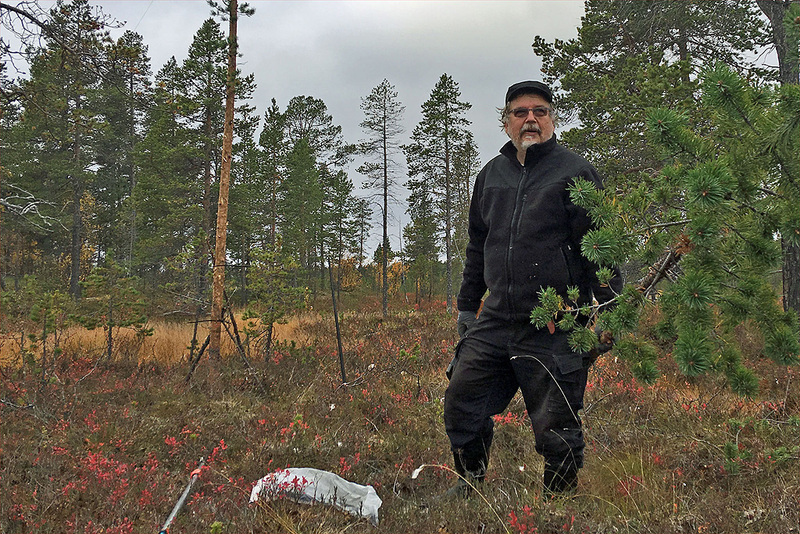 Kimmo and Tuomo have spent time updating antennas at their remote listening base, which they have successfully used for several years. I might have something interesting from Thailand on my 80-degree wire, but that remains to be seen. Later in the evening, a couple of stations from Western Australia appeared briefly, but again nothing new. So far this looks like a second day without any new catches. 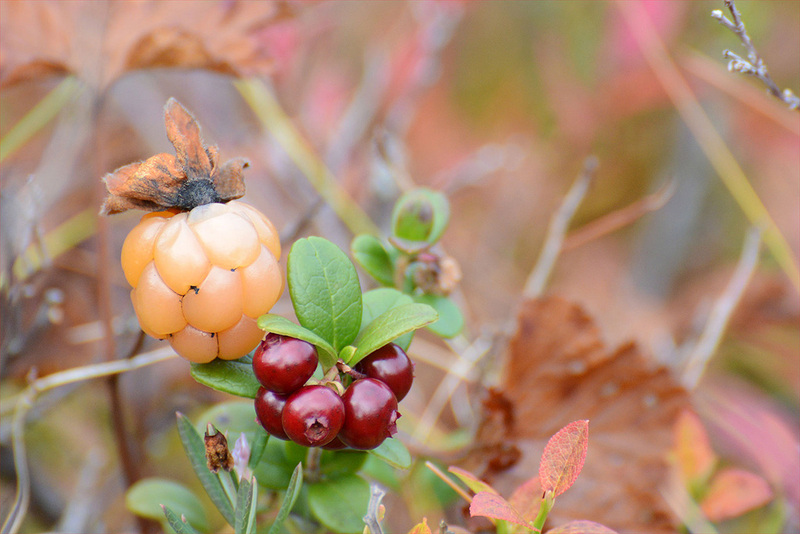 Cloudberry was past season but still edible, and lingonberry was at its best in September. Another less than spectacular night, with some Brazilian and Argentinian stations heard around 01000400 UTC, but I didn't notice anything beyond the usual suspects. 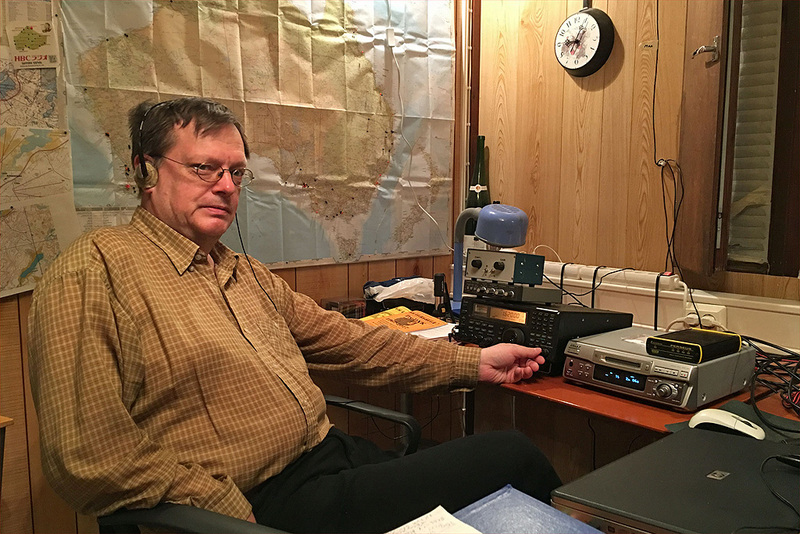 After 0400 UTC the AM band was quiet, so I slept a bit, collected my gear, cleaned the cabin, and headed driving south to Rovaniemi, where I took the overnight train to Helsinki. 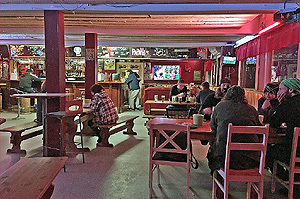 I had dinner at Xiang Long Restaurant in Rovaniemi, where the interior decor was more Chinese than the food  but after two weeks in the cabin, anything outdoors actually tastes pretty good. This DXpedition certainly doesn't go into history books because of its achievements, but I still had some memorable moments on the AM band. At least I got more new stations from Argentina than on any single DXpedition before. Complete logs for this DXpedition will be published on DXing.info after several years, because I first need to go through the backlog of recordings from many earlier DXpeditions. Despite the disappointing results, it was of course fun to "get away from it all", and just to focus on DXing in good company!